That was the message Community Board 12 (CB12) heard over and over at Thursday evening’s public hearing on the city’s proposal to rezone Inwood. A standing room only crowd filled the auditorium at I.S. 52 on Academy Street on February 22. Police were on hand, and eventually limited access because more people wanted in than the fire code would permit. While some residents were raucous and emotional, others struck a more analytical tone in their assessment of the rezoning proposals. 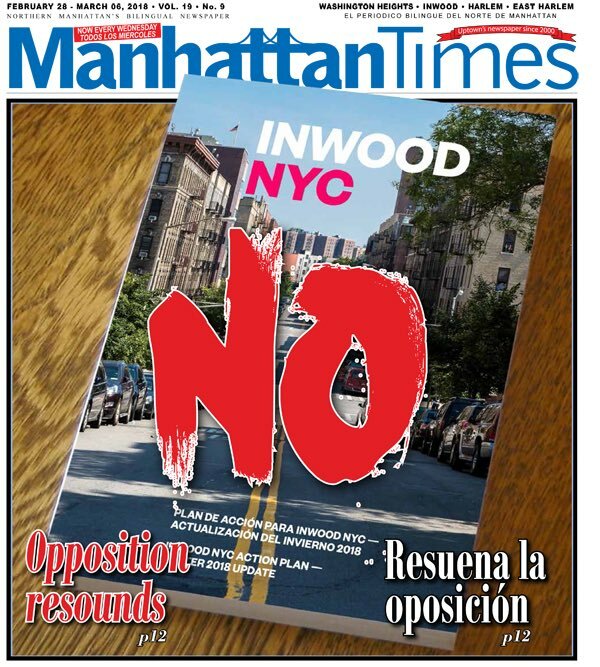 But the general consensus was Inwood does not want the approach presented by the New York City Economic Development Corporation (NYCEDC). Residents pleaded their library not be demolished, argued that 14- and 23-story buildings would ruin the neighborhood’s character and available sunlight, and insisted rezoning in general will increase gentrification and raise rents for businesses and tenants at an unsustainable pace. In recent days, a neighborhood group, Uptown United, put together its own proposal. In stark contrast to the city’s version, the alternative proposal seeks to preserve the existing housing stock and create more, lower priced and affordable housing.